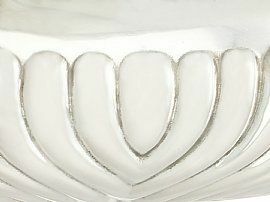 Each component has an oval rounded form to a plain oval collet foot. 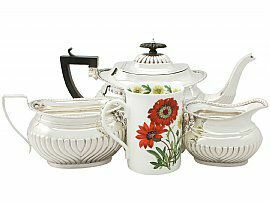 The lower portions of the teapot, cream jug and sugar bowl are embellished with embossed fluted ornamentation. 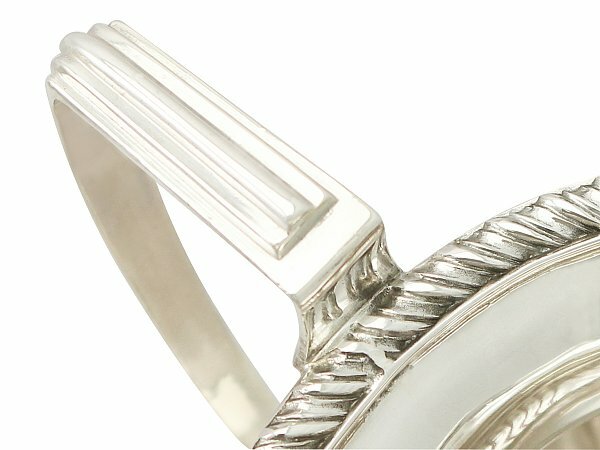 The flared upper rim of the cream jug and sugar bowl, and shoulders of the teapot are ornamented with an impressive applied gadroon decorated border. The large teapot is fitted with a domed hinged hallmarked cover, which features further embossed convex fluted decoration. 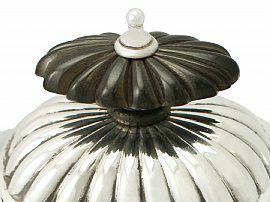 The cover is surmounted by the original carved oval fluted painted wood and sterling silver finial. 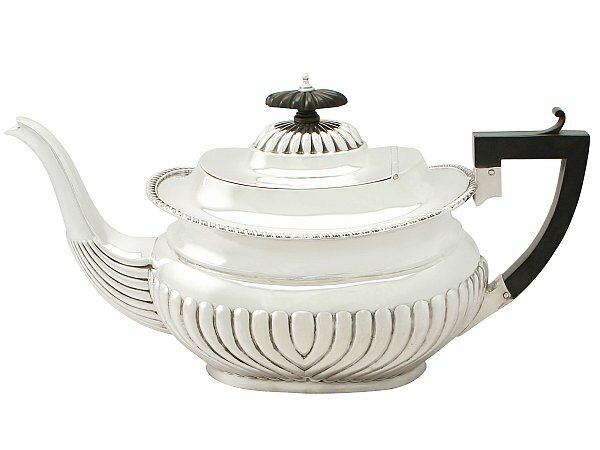 The teapot retains the original plain angular carved painted wood handle with a carved scroll style thumbpiece. 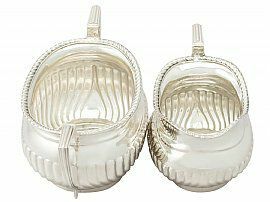 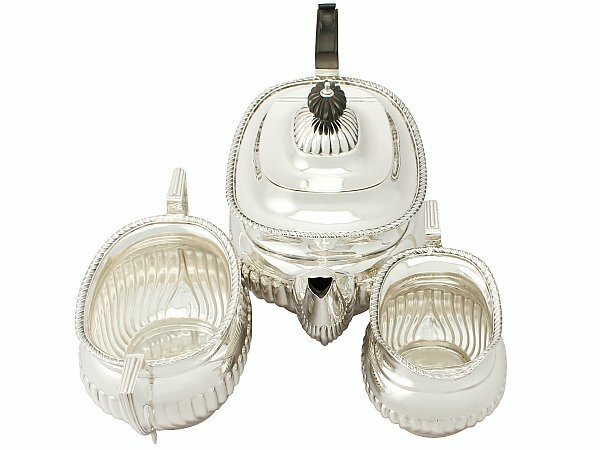 The cream jug and sugar bowl have plain angular sterling silver handles ornamented with subtle applied decoration. 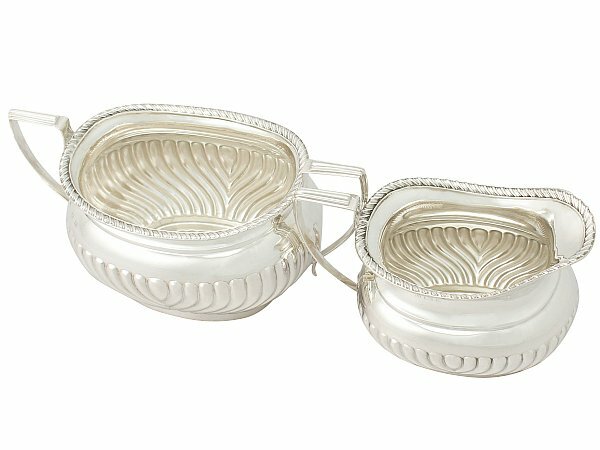 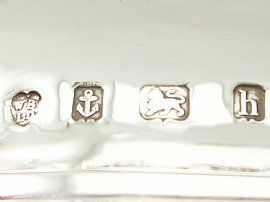 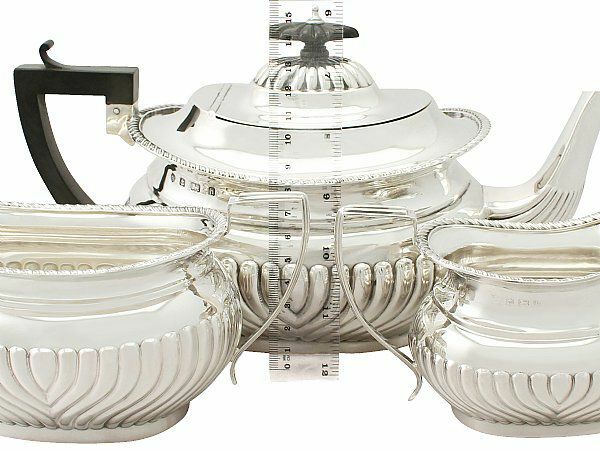 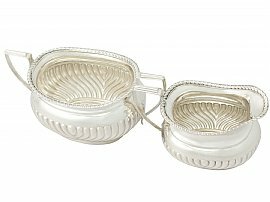 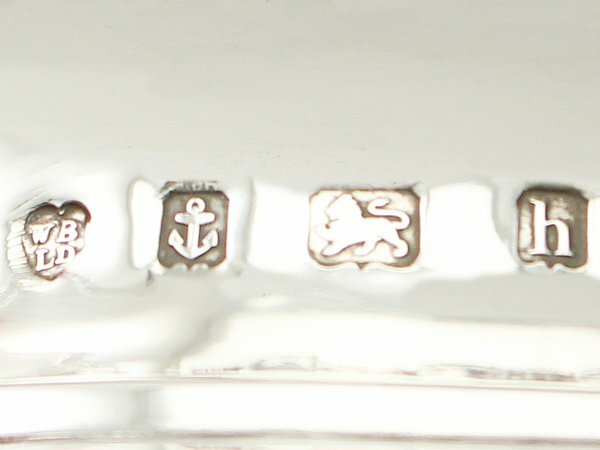 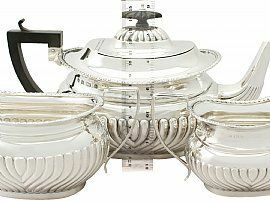 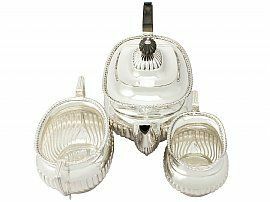 This antique sterling silver tea service is a very good gauge of silver, fine quality and in excellent condition. 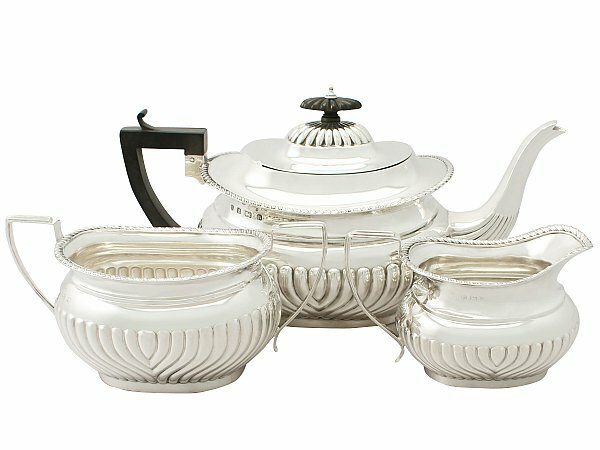 The pieces of this Edwardian tea service have been professionally polished and are in presentation condition. Full hallmarks struck to the surface and part hallmarks to the teapots cover are very clear; the hallmarks to the surface of the cream jug and sugar bowl have wear in keeping with age, however remain legible. 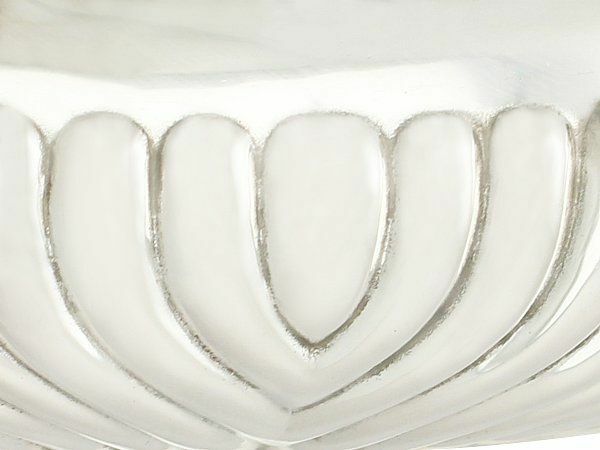 Reflections in photographs may detract from the true representation of this piece of antique Edwardian teaware. 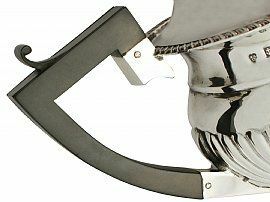 Length from back of handle to tip of spout 29cm/11.5"
Height to top of finial 15.2cm/6.2"
Length from back of handle to lip 14cm/5.5"